Motorola is back, and we all know that. The brand name has returned as there won’t be any ‘Lenovo Moto’ from now. Today, the company launched its premium high-end smartphone of 2017, the Moto Z2 Force. 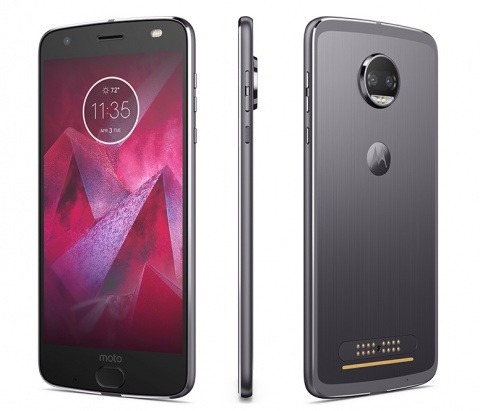 It is the successor of last year’s Moto Z Force and the specifications as well as the design of the phone show that it is a great upgrade from last year. And yes, did we mention that the phone is on every major US Carrier? The Moto Z2 Force is powered by the octa-core 2.35GHz Snapdragon 835 processor, Adreno 540GPU and has 4 Gigs of RAM along with 64 Gigs of onboard storage. Outside the US, the phone has also got a 6GB RAM and 128GB ROM model. Under the hood, the phone runs on Android 7.1.1 Nougat and just like the previous Motorola phones; the Moto Z2 Force has got almost stock android experience with some moto add-ons. Coming to the camera section, that’s where everything changes when the phone is compared to last year’s Moto Z Force. Not the phone has a dual rear camera setup with dual 12MP cameras with f/2.0 aperture & Sony’s IMX386 sensors. The cameras come with Depth detection, and depth effects, Zero Shutter Lag (ZSL), Phase Detection Auto Focus (PDAF), Laser Auto Focus, Closed loop actuator, Color Correlated Temperature (CCT), dual LED flash & Professional mode. There is also a B&W Mode that uses the Monochrome sensor to capture B&W shots. Lastly, there is a wide angle 5 MP selfie camera with f/2.2 aperture & LED flash. The Moto Z2 Force is only 6.1mm thick, but this is because the phone has a smaller battery than the last year’s Moto Z Force. As previously reported by VentureBeat, the phone has got 20% smaller battery. This means the Z2 Force has a 2730 mAh battery compared to the 3,500mAh battery of last year’s Z Force. Motorola seems obsessed with slimming down its devices, but that means sacrificing of the battery size. Let’s see how the battery performs because it all depends on the software optimization and the processor. There is also Turbo charging support, and the phone does ship with a Turbo Charger inside the box. Now, along with the battery size, the headphone jack was sacrificed too. Yes! The Moto Z2 force doesn’t feature any 3.5mm headphone jack, so there are now two ways to listen to the music – via USB Type-C Port or a Type-C to 3.5mm converter. The Modo Mods are here to stay as the phone comes with Moto Mods support. Lastly, talking about the sensors, the phone has got Fingerprint Sensor, Accelerometer, Ambient Light, Gyroscope, Magnetometer, Barometer, Proximity, Ultrasonic, and Audio monitor. There is Bluetooth 4.2 on the phone, but the company said that it would be updated to Bluetooth 5.0 after Android O Update. Well, the Moto Z2 Force is a great smartphone, no doubt. But there are some things that Motorola should’ve improved. First of all, the company should stop its obsession with slimming down its phones and decreasing battery sizes. Also, it would’ve better if the headphone jack was there as on the Moto Z2 Play. Lastly, there is no IP67 or 68 rating, so the phone isn’t waterproof like it competitors ( Galaxy S8 and LG 6). However, there is Water repellent nano-coating. Three colors choices include Super Black, Fine Gold, and the Lunar Grey. The Lunar Grey color is exclusive to T-Mobile. Starting from August 10, the Moto Z2 Force will be available unlocked on all the four major US Carriers. Also, the Pre-orders begin from tomorrow in the US. The price depends on where you buy it as on Verizon, the pre-orders are going for $756 (unlocked), and on the official Motorola website, the price mentioned is $799.99. What are your opinions about the phone? Do let us know via the comments section.